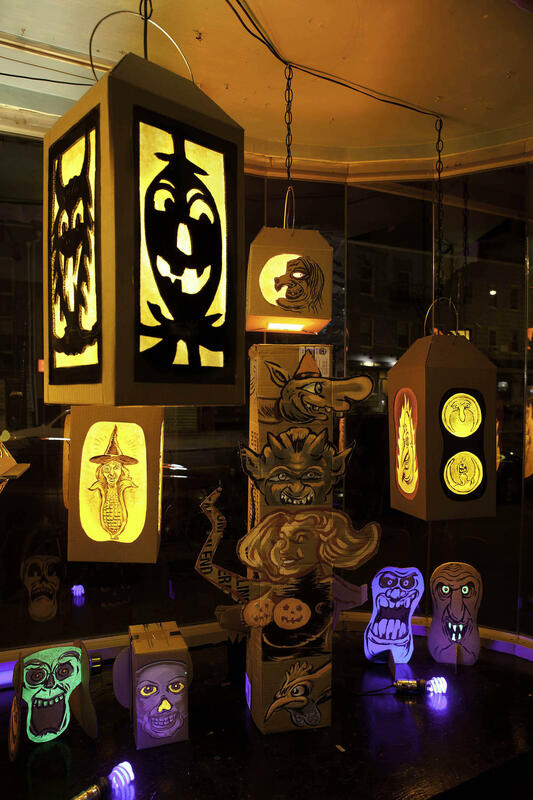 Gary Leib's Halloween window at Desert Island Comics in Brooklyn in 2011. Based on a story by Pete Hamill, two friends from a Brooklyn grammar school reconnect and realize the impact they and their work had on each other. A Poet Long Ago, directed by Bob Giraldi, screens at FilmColumbia in Chatham, NY during their shorts program on Sunday. In the film, Sonny, a sanitation worker, and Malloy, a newspaper writer, meet by chance and reminisce about their grammar school days together back in 1970s Brooklyn. Immediately an old wound is opened; flashbacks show how the least likely of the pair had his astonishing gift of writing poetry beaten out of him forever by the narrow-minded father hell-bent on protecting him. Bob Giraldi is a longtime director who has done everything from directing the film, Dinner Rush, to directing the music video for Michael Jackson’s “Beat It.” Pete Hamill is widely known for his contributions to the New York Post and the New York Daily News as a columnist and editor. Working mainly in television, director Brian Percival has made quite a name for himself in the UK with his work on Downton Abbey extending his reach to this side of the Atlantic. Percival’s debut theatrical feature The Book Thief is generating early buzz as a contender in the upcoming Hollywood award season. The film will screen as part of the FilmColumbia Festival this Sunday at 3:30pm. FilmColumbia - Chris Schoeck - "Bending Steel"
Bending Steel is a documentary from filmmakers Dave Carroll and Ryan Scafuro. It explores the life of 43 year-old Chris Schoeck, a Queens, NY native who is training to become a professional Oldetime Strongman. The story follows Chris’ journey from his early days training in a small basement storage unit, to his very first performance on the big stage at New York’s historic Coney Island. The film will screen at FilmColumbia on Saturday, October 26th at 5pm with a presentation by Schoeck to follow. Joe Donahue spoke with Chris at Argot Studios in NYC. During the interview Chris ripped a deck of cards in half and bent a steel spike. Videos below. This year’s FilmColumbia Festival kicked-off last night with a screening of Philomena, starring Judi Dench and Steve Coogan and directed by Stephen Frears. Throughout the rest of this week and coming weekend, the 14th annual festival will show yet-to-be-released independent and foreign films, shorts, and some studio films in a lineup that includes the much buzzed about August: Osage County; Mandela: Long Walk to Freedom; and the new Coen brothers’ film Inside Llewyn Davis. Here to tell us more about the line-up are Peter Biskind, Executive Director and Co-Programmer of the FilmColumbia Festival and Calliope Nicholas, Director of FilmColumbia.